Author and essayist Kiese Laymon is one of the most unique, stirring, and powerful new voices in American writing. 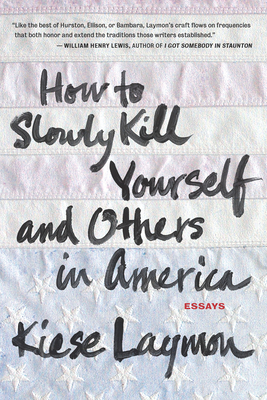 How to Slowly Kill Yourself and Others in America is a collection of his essays, touching on subjects ranging from family, race, violence, and celebrity to music, writing, and coming of age in Mississippi. In this collection, Laymon deals in depth with his own personal story, which is filled with trials and reflections that illuminate under-appreciated aspects of contemporary American life. New and unexpected in contemporary American writing, Laymon's voice mixes the colloquial with the acerbic, while sharp insights and blast-furnace heat calls to mind a black 21st-century Mark Twain. Much like Twain, Laymon's writing is steeped in controversial issues both private and public. This collection introduces Laymon as a writer who balances volatile concepts on a razor's edge and chops up much-discussed and often-misunderstood topics with his scathing humor and fresh, unexpected takes on the ongoing absurdities, frivolities, and calamities of American life. Kiese Laymon was born and raised in Jackson, Mississippi. He attended Millsaps College and Jackson State University before graduating from Oberlin College in 1998. He earned an MFA from Indiana University in 2003 and is now an associate professor at Vassar College.